On the bus from Maputo to Inhambane, we decided not to stay at Fatima’s nest, the sister hostel to Fatima’s in Maputo. Already, we had been unpleasantly surprised several times with the lack of service at Fatima’s but after they misinformed us significantly about the taxi fare from the hostel to the bus station and about the bus fare to Inhambane, I had gotten too fed up with them and didn’t want to poor any more money into their coffers. No less then 9 travelers were moving from Fatima’s in Maputo to Fatima’s in Inhambane. 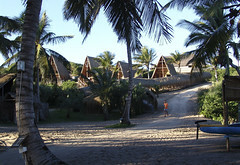 Four of us decided to head out to Bamboozi lodge, close to our original destination. When you’re going to Inhambane, mostly, you’re not actually going to Inhambane, but to one of the nearby beaches. We ended up on Tofo beach, a beautiful stretch of coastline. Mozambique is well known for its exceptional beaches and here we could see why: Wide white and nearly empty beaches, we felt like being in some commercial. Bamboozi also had a very good restaurant and bar, on top of the dunes, overlooking the Indian ocean, where most of the glasses are actually sewn off bottles. Truly magnificent. After South Africa, we finally were starting to wind down, taking it really easy, lounging on the beach, eating and drinking. So, not much happened here, really. Our adventures were starting to get limited to events like remarking that the salt shaker had an image of a boy running after a chicken, under which a line of text read ‘see how they run’.